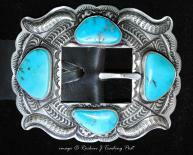 Lawrence Delgarito is a very talented and long-time silversmith. Some of you may know his work under the trademark of "Two Dogs." He resides with his wife and 7 children, in Smith Lake, New Mexico, where he was born and raised. Lawrence started doing jewelry, for himself, when he was 20. He, like so many others, learned his trade by watching a family member. In this case, his older sister. Of Lawrence and his seven siblings, five of them make jewelry: himself, both of his sisters and two of his brothers. One of his brother's is in the military, one works on the railroad and the other lives in Salt Lake City. Lawrence's favorite part of jewelry is working with the silver and molding it into a thing of beauty. Watching him work is quite the privelege! The design process is the hardest part of him, but he always wins out and produces some very nice pieces. 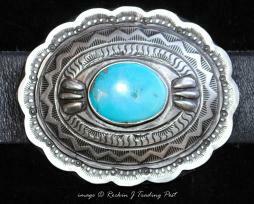 He makes concho belts, bracelets, ranger buckles, silver kachinas, kachina bolos, 3-D bracelets, storyteller bracelets and trophy buckles. 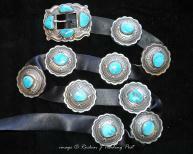 Of these, he most enjoys making the 3-D bracelets, storyteller bracelets, kachinas and concho belts. Lawrence truly enjoys sharing the beauty of his work and wants the whole world to see his artwork so that they may enjoy it as well.